The cover features rounded corners for aesthetics and is secured by locks deterring theft of the tablets. The cover is available in either an Mild steel, White or Black finish and with or without access to the Home button and camera to support the specific needs of the installation. The enclosure is available for the tablets digital devices. iPad pro 12.9", iPad pro 9.7"
Tablets compatible iPad Air & Air 2,iPad 2,3,4,iPad pro 9.7"
Usage POS, Customer feedback, education, health-care, corporate, retail and point of sale environments. 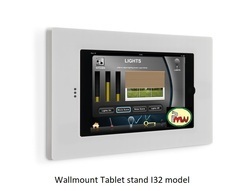 The I32 Tablet Enclosure secure wall mount is the ideal wall mounted tablet security solution for all display settings including education, health-care, corporate, retail and point of sale environments. The Enclosure for Ipad Tablet Kiosk has proper ventilation and access to the audio and charging ports for continuous charging. Dedicated cutouts allow access to the On/Off and volume buttons, without removing the tablet. These features allow for a fully functional device even when locked in the Apple Ipad Air Tablet Enclosure. The keyed lock makes it easy to access when tablet maintenance is required. With soft edges and rounded corners the aesthetic of this enclosure is very appealing and fits all display environments. The combination of this sturdy steel enclosure allows the tablet to be protected against high traffic withstand rough use in public setups - yet stylish enough to blend into any environment! Our in-wall flush mounts are available in variety of colors, with or without access to the home button and security option, for iPad and iPad mini and with many mounting options. Black finish on steel / aluminium construction is durable for years of use. Built-in lock protects iPad from theft. Wall mounting bracket rotates 360° and tilts for ideal viewing. Enclosure is made for the Apple® 2nd, 3rd, 4th, or Air generation tablet for versatility. Foam pads are included to protect the tablets from scratches. Designed with camera hole, square card reader bracket and home button is hidden in the case to prevent unwanted tampering. 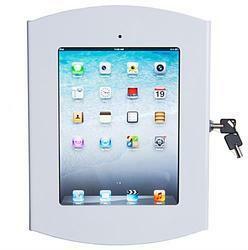 Looking for Wall Mount secure Tablets covers ?